ABBOTT MOTORS, An exceptional car buying Experience, is offering this exceptional vehicle for sale. CALL or TEXT (716) 229-5711 for quick answers to your questions about this vehicle. Your message will be answered by a real human never an automation. We stock only the highest quality vehicles which have undergone a full safety inspection, fresh oil change, professional detail and Carfax Guarantee. All vehicles come with a Written Warranty and Extended Warranties are also available. 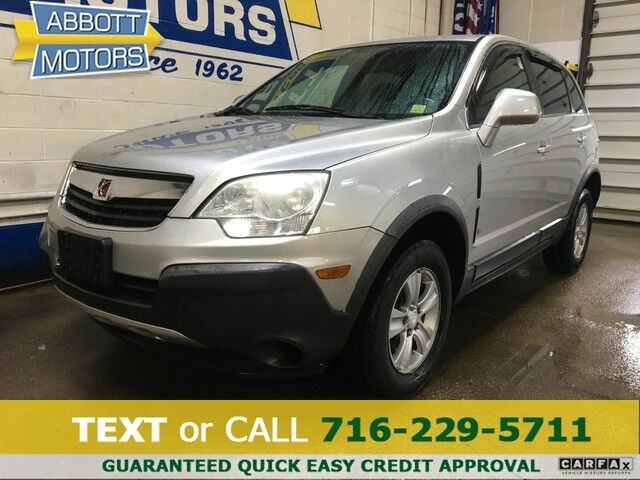 This 2008 Saturn VUE comes with a CARFAX Buyback Guarantee, which means you can buy with certainty. The Saturn VUE XE w/Low Miles offers a fair amount of utility thanks to its advanced features and unique styling. It's also quite sporty, and injects an ample amount of handling chutzpah into the ridin'-high body of a family-friendly SUV. The VUE XE w/Low Miles is well maintained and has just 108,159mi. This low amount of miles makes this vehicle incomparable to the competition. This pre-owned Saturn VUE looks like new with a clean interior that's been well-kept. This impeccably built Saturn VUE XE w/Low Miles comes with a plethora of added features that have made this vehicle a unique find. These options will simply amplify the experience of owning and driving this wonderfully crafted Saturn. Searching for a vehicle shouldn't mean that you have to buy one with flat, bald, and outdated tires. In the case of this 2008 Saturn, the tires have been recently replaced and show to have good tread. This car has an exceptional paint finish that shows no sign of age or wear. Upgraded wheel package makes this Saturn VUE stand out from the rest. More information about the 2008 Saturn VUE: The base 2008 Saturn Vue XE with, in front-wheel drive, represents a particularly strong value, with its wide range of standard features and economical engine, while the Vue Green Line will appeal to those who want to make an eco-friendly statement. It carries an EPA fuel economy rating of 25 city, 32 highway--the best of any sport-utility vehicle for 2008--and it's also quite affordably priced, starting at less than $25,000. In general, the Vue has a nice, controlled ride and good carlike handling, matched with an especially roomy interior and good towing ability for its size. Interesting features of this model are controlled ride, fuel economy (XE and Green Line), standard safety equipment, New look, extensive cargo space, and towing stability feature. ABBOTT MOTORS has over 50 years of automotive experience! We are also a CARFAX Advantage Dealer specializing in outstanding customer service and satisfaction! FINANCING FOR EVERYONE...ALL CREDIT APPS ACCEPTED. We look forward to helping you purchase your next vehicle. Apply Online 24/7 at Abbottmotors.com ... All Trade-ins Welcome... Same Day Delivery... Call or Text Today and See The Difference... We Look Forward to Serving You!! This vehicle may be subject to potential open recall(s). Vehicle recall information may be found at Safecar.gov. Please verify price, equipment, options and features with your sales rep before your purchase. We Look Forward to Serving You. *Tax, title, plates extra. All Financing On Approved Credit. We are a BBB accredited member.